The instantly recognised phrase ‘Liberty, equality, fraternity’ is in a way the most significant national motto of France. There has always been a tradition of rebellion in France. Not only the obvious famous 18th century revolution, but in the spring of 1958 then President René Coty told his Parliament that France was “on the brink of civil war”, related to Algeria. The outcome was a national legendary unifying figure selected by political consensus, General de Gaulle, who was asked to confer with the French leadership to examine what, in the framework of “the Republic’s Constitution”, would enable the immediate formation of “a government of national safety” and “what can be done, in a fairly short time, for a deep reform of our institutions”. Coming to the present day, the heart of the matter is the fact that Macron should never have been elected president because the manner of his winning the presidency was and is considered by many Frenchmen to have been highly dubious and even fraudulent, hence his personal extremely low popularity. 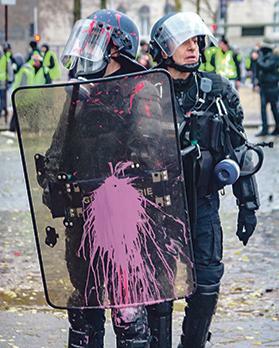 An interesting observation was made by a French Professor Olivier Cahn, who said “the tradition (of revolt) takes root because protests get results in France”. We have recently witnessed the worse riots in France for over a half a century. A consequence of such events, simply put, is that such massive popular riots can and will turn into revolutions, and possibly in other countries as well, in the 21st century. That Paris-like events will be repeated throughout European cities, even in the UK, even across the world, in 2019 is now inevitable. I feel the people want and demand change and justice, the young in particular. They, people of the world, are uniquely connected, as in no other way in history by instant transmission of events through the internet and social media. When for example Blair and Sarkozy, to name but two former leaders, are arrested and in court, people will see, maybe for the first time in their lifetime, justice truly being served. That such politicians get away with killing millions of people and making millions of dollars to boot, abusing their positions as public servants, is totally intolerable and absolutely unacceptable. Throughout history people revolted due to exploitation, unfair taxes and injustice by their rulers. Why not revolt against unpopular and unjust governments? The great philosopher, it happens, a Frenchman, Jean Paul Sartre is important to mention now. He said Che Guevara was “the most complete human being of our age”. I contend Guevara was never a real communist, but it suited the powers that be then (and himself) to be labelled so. He was, I believe, simply an anti-imperialist – a Don Quixote figure; an idealist but nevertheless a revolutionary. We see the revival of imperialism in the 21st century, which makes rebellion and taking to the streets the people’s last and only recourse. There is a very pertinent short speech on the subject by Guevara, from 1965, only some 30 seconds long, where he articulates the perils of imperialism very eloquently. It was published recently on a Canadian website, a think tank called Global Research, entitled ‘Video: Che Guevara Talks About Imperialism (1965)’. The original important role of the press was to question power and authority to keep in check abuses and lies of corrupt politicians and systems. Good journalism was and is a necessary and critical balancer to maintain democracy. ‘Mass Media’ owned by a small elite, particularly the visual snapshot sound bite variety, are the most guilty of all – they are traitors to true journalism with very few exceptions. So to conclude, I am not qualified to give solutions to the plethora of the world and society problems, but I for one would welcome revolution where necessary, particularly in Europe, if only to get rid of one of the most corrupt institutions ever to exist in history, in Brussels.